Appearance: Hollycrest is a muscular she cat with short and thick black fur that has amber tabby stripes. She's long legged with small paws and long claws that aid her in the trees. Her eyes are a bright, ice blue and her tail is long and fluffy. Mutation: A long tail and long, narrow claws. Personality: Hollycrest is an oddly distant shecat with the habit of staying up in the trees. She has a dangerous temper that can be set off quite easily given the circumstances. She's loyal to the bone, and she'd give her life to protect her clan from any type of threat. Once you get to know her, she's not very different than how she appears; cold and reclusive. Her friends are few, trusted cats even fewer, and she has an ever present fear of having kits, despite already having a litter. She does have her brighter sides though. When she loves someone, she does it wholeheartedly, and her protective nature is ever present. History: Hollycrest was born to the queen Brackensong and the warrior Badgerleap, but sadly her mother didn't live long past birth which left Hollykit and Wolfkit with their father who fell into a state of constant depression. One that worsened when Wolfkit died the day after they were born. Hollykit remained the sole surviving kit, and the rest of the queens cared for her. 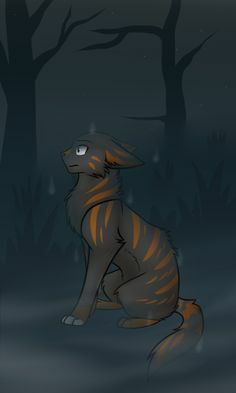 Unfortunately, the night of Hollypaw's apprentice ceremony, she lost her father to a fallen tree. The tom had bravely pushed an apprentice out of the way, which succeeded in him losing his life after being crushed by the tree. Hollypaw barely had time to say goodbye to her only living family before he died with a smile. She spent that night in the clearing with her nose buried into her father's cold fur. It was after that night that Hollypaw became the secluded and quiet shecat she is now. She vowed to never have kits, because the thought that she could possibly leave them the way her mother left her sunk her heart into the dirt beneath her paws. However, her vow was broken when later on, after gaining the warrior name Hollycrest for saving a litter of kits, she met Foresthowl. They bonded quickly, and moons later, had a litter of four kits, one of which died and was named Fallenkit. The living three, two toms and a shecat, were named Twilightkit, Tranquilkit, and Hopekit. Appearance: Hopekit is a slender tortoiseshell kitten with bright green eyes, and various shades of amber acting as the patches on her body. She has wide shoulders and long legs. Mutation: A long, slender tail and long, narrow claws. Personality: A lot can be assumed when you first see Hopekit, but most know that above all else she's friendly and captivating. Of course she's also responsive, charming and considerate, but far less strongly and often mixed with being narcissistic as well. Her friendliness though, this is what she's kind of cherished for. People often count on this and her responsiveness whenever they need help. Nobody's perfect of course and Hope has plenty of character faults too. Her barbaric nature and hatred pose plenty of problems on often personal levels. Fortunately her captivating nature shines brighter on most days. History: Hopekit, Twilightkit, and Tranquilkit were born to Hollycrest and Foresthowl of CrestClan. Sadly their lives took a turn for the worst when Fallenkit was named as such due to being a stillborn. Appearance: Frostedstep is a gorgeous shecat with the mutation of vitiligo, which caused spots in a variety of colors to appear on her pelt as she aged. She, beneath the spotting, is a faded tortoiseshell with blue eyes flecked with brown. Personality: Frostedstep enjoys thinking that she is regal and perfect, despite that exact arrogance being her biggest fault. She does have redeeming qualities in her loyalty and protectiveness. When made a warrior, she was noted for her endurance, her strict biding to the Warrior Code, and her tireless energy. While all of those did humble her slightly, it more so fed her ego, bringing with it a higher than thou attitude. She can have a temper, and she's a force to be reckoned with when it comes to her loved ones. She's devoted in her duties, but she tends to neglect some for what she calls "personal care." History: Frostedkit and Whirlkit were born to two respected CrestClan warriors. They were mothered by Littleflame, who coddled them at first but with their father's, Spottedsnake, intervention, she let up on her grip. Their kithood was normal and easy, despite the two having been born mid leaf-bare. True, they went slightly hungry at times, but they managed. When she was made into Frostedpaw, she was given a mentor in Blackstreak, a battle-scarred tom who was missing half of his left ear. She feared him at first, but warmed up when she discovered he was quite warm in attitude. The two worked well together, even when she stressed over the appearances of her spots, and she received her name, Frostedstep, upon reaching fourteen moons. She swears that her mentor showed more pride than even her parents. Three moons later, she dived back into family life with the birth of her siblings Inkkit and Poolkit. Appearance: Willowpaw is a pretty shecat with grey-ish spots covering her body, but they fade to stripes around her paws, and cover the entirety of her ears. The base of her coat is an abalone shade of grey with more yellow tints, but her neck, a portion of her face, and her underbelly are a lighter cream color. Finally, she has bright, green eyes. Mutations: A long, slender tail and long, narrow claws. Personality: Willowpaw is hot-headed and quick to rush into sticky situations. She's sassy to her mentor, and still incredibly close to her brother, Flickerpaw, and with that closeness comes mischief and rule breaking. Despite her immaturity, she is devoted to her training and to her clan, with a stubborn protectiveness of it. She can be loving, but it is a rare case when she warms up to someone. History: Born to the queen, Ravenfoot, Willowkit only had one sibling in Flickerkit. They were thick as thieves, and their father, Goldenblaze even joined their mischief to an extent, much to his mate's disdain. They had an easy kithood, and started with an easy apprenticeship as well. However, shortly after the birth of Swiftkit and Grasskit, Filckerpaw and Willowpaw lost their father to an infected injury.